Tofu tikka masala is my spin on classic paneer tikka masala and trust me this tofu tikka masala recipe is gonna blow your mind with its deliciousness! This is going to create history! I swear! Once I publish today’s recipe of tofu tikka masala, it’s going to be two back to back tofu recipes on my blog! Wow! That’s rare! I mean, I do love tofu and eat fair share of this goodness, but two consecutive tofu recipes? That’s real tofu deal, I must say! 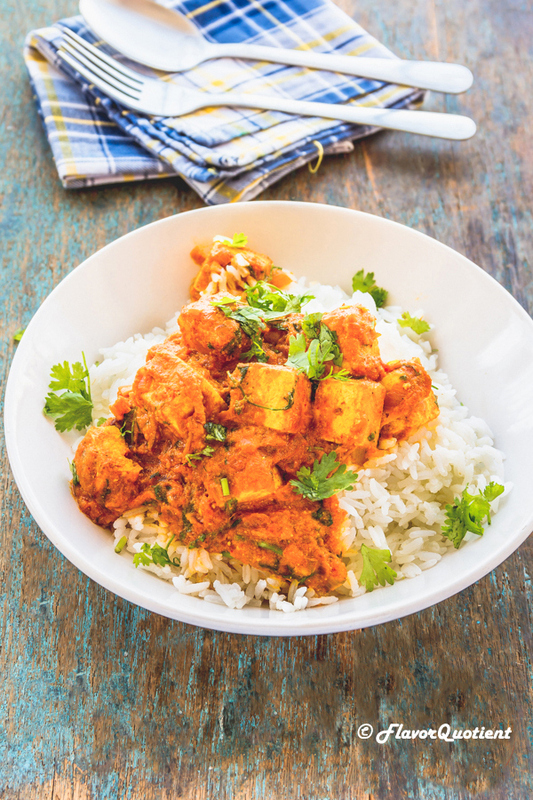 Well, what has to happen would always happen, just like this amazing tofu tikka masala which is the perfect alternative of paneer tikka masala, especially if you are trying to cut down the calories from your diet without compromising the taste. 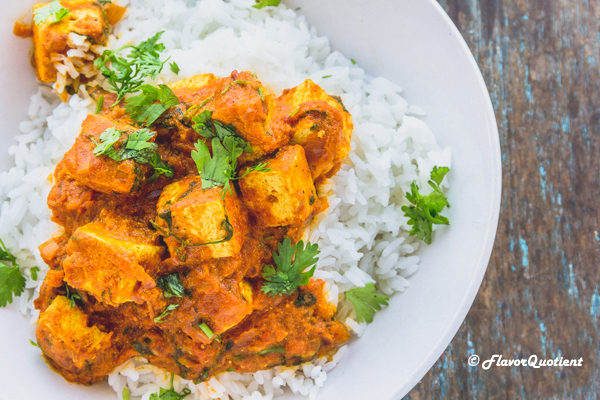 I made my tofu tikka masala just like any other tikka masala and the firm tofu cubes beautifully soaked up the flavors of tikka marinade. Finally, the tofu tikkas are simmered in the onion-tomato gravy and you get the most amazing tofu tikka masala right on your dinner table! Tikkas are one of my favorite items, be it chicken tikka or paneer tikka. So, I thought to give my favorite recipe a spin and this mind-blowing tofu tikka masala churned out of my kitchen. Am so happy it did! I am always looking for new tofu recipes but unfortunately it doesn’t yet have many uses in Indian cuisine. But on the other hand, we already have something which can be considered as the first cousin of tofu and that is nothing but our good old paneer a.k.a. cottage cheese. If you are Indian and haven’t used tofu much yet, you can think of tofu as paneer made from soy milk and use it as a paneer substitute in any recipe; trust me they will turn out as good as paneer! My blog already hoards ample paneer recipes which thankfully my readers have given loads of love to. Now, I thought of shifting my focus to a paneer alternative which is tofu and guess what! People are loving them too! I can’t be happier about it! My Vegan sweet and sour tofu became an instant hit with my readers and I am hoping you guys will shower this tofu tikka masala recipe with equal love and care. I wish I had done this tofu tikka masala a complete vegan recipe. But don’t worry, this tofu tikka masala can be done in complete vegan way and I will show you how! Tofu is a great choice for vegan diet and I would be more than happy to share as many new tofu recipes as possible with you all! To make tofu tikkas, like any other tikkas, you need to marinade them in a yogurt-based mixture which is infused with all the flavorful Indian spices like garam masala, chili powder, coriander powder and aromatics like ginger and garlic. 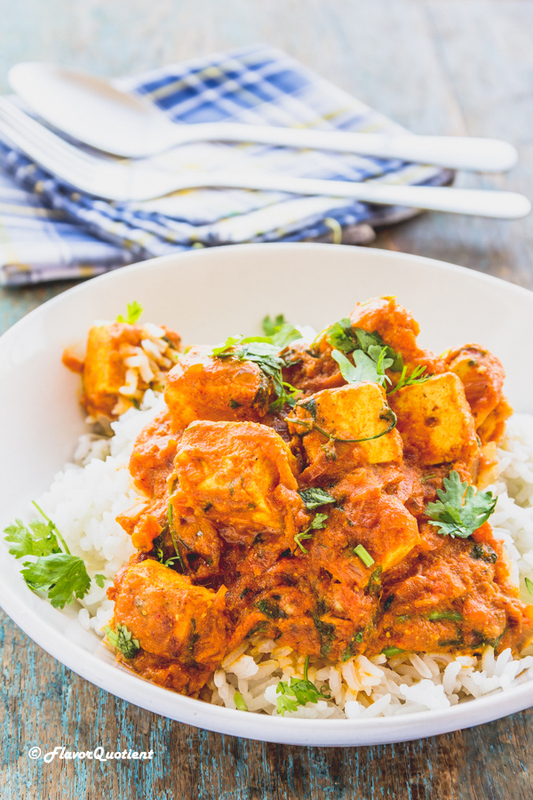 If you want to make this tofu tikka masala completely vegan, you will need to substitute dairy yogurt with a dairy free option like almond milk yogurt or soy milk yogurt whichever you prefer. Though I love to finish off my regular paneer tikka masala with a dollop of fresh cream at the very end, I completely skipped it for my tofu tikka masala and it still turned out to be super delish besides being way less in calories. So, what are you waiting for? Make this tofu tikka masala when you get your next packet of tofu and you will love it for sure! Enjoy! To make the tofu tikka marinade, take the tofu cubes in a large bowl, add ginger & garlic paste and all spices listed under marinade. Add juice of the one lemon, 2 teaspoon oil and yogurt. Give them a good mix with your hand so that all tofu cubes are well coated with yogurt and spices. Set aside for half an hour. For making the tofu tikkas, grease a grill pan with 2 tablespoons of oil and bring it to smoking hot. Roast the tofu on medium flame for 2 minutes on each side until they are lightly charred and golden brown in color. Take them out and set aside till you prepare the sauce. Take a large pot and add 2 tablespoons of oil. Heat it on high flame and once hot, bring the flame down and add cinnamon, black cardamom & cloves. Let them become fragrant in hot oil for 30 seconds. Add the onion puree to the tempered oil and sauté them medium until the onion turns golden brown and oil starts oozing out; this would take about 10 minutes on medium. Next add the tomato puree and green chili. Stir to mix well and let it cook for 5 minutes until the raw smell of tomato puree goes away. Now add the roasted cumin powder, dry ginger powder, sugar and salt to taste to the pan. Cook the spices well for a minute and then add tomato ketchup. Mix everything well. Once the spices are nicely sautéed and oil starts to resurface on the sides of the pan, add about a cup of water, preferably hot water and give a good mix. Bring the water to a rolling boil on high. Once the sauce starts boiling, drop the prepared tofu tikkas, stir, cover and let them simmer in the sauce for good 10 minutes. The tomato-based gravy will take some time to mature and mingle with all the flavors as well as infuse the tofu cubes with all the spicy goodness. After about 10 minutes, uncover the pan. Check the consistency of the tikka masala gravy and adjust if needed. Check and adjust for seasoning if needed. 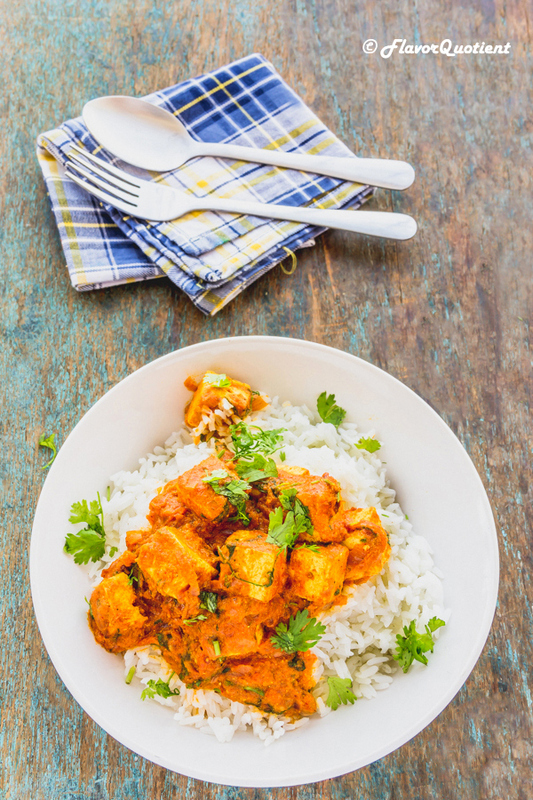 Finally, sprinkle freshly chopped coriander leaves and serve your tofu tikka masala warm with plain rice or naan. Enjoy!